With their cool, hard and smooth surfaces, glass and stone are natural complementary partners giving a clean, hygenic feel to the bathroom or workspace. Combining a colour in the kitchen with matching cabinets enables you to emphasise timber elements such as light wood flooring. Glass is a natural conductor for light, so when a feature LED strip or spot is cast onto the glass, a cool effect is created. The colour is illuminated and diffused across a large area. Selecting a colour is not as daunting as it initially seems. Provided you follow a couple of design guidelines, the task becomes easy and colours almost choose themselves! If you still would like a hand in selecting, meet with one of our Auckland consultants and we will point you in the right direction. Your choice of cabinets and benchtop will naturally steer you in the direction of some colours over others. You can choose to stay neautral and go with soft, similar or complementary shades. However if the kitchen feels like it is lacking in a feature, go ahead and inject some colour. Brighter, saturated colours work especially well in white kitchens or dark kitchens lacking contrast. The lighting in the room plays a big part in colour selection. A dark kitchen may not suit a dark metallic or black as it will close the space in. In small kitchens we generally suggest a lighter colour (or a mirror). Feature LEDS and spot lighting can really show off a colour on the glass, so keep lighting in mind (even at night) when making your selection. We have a range of colour samples from our own range already painted to glass and available to browse or collect from our showroom. 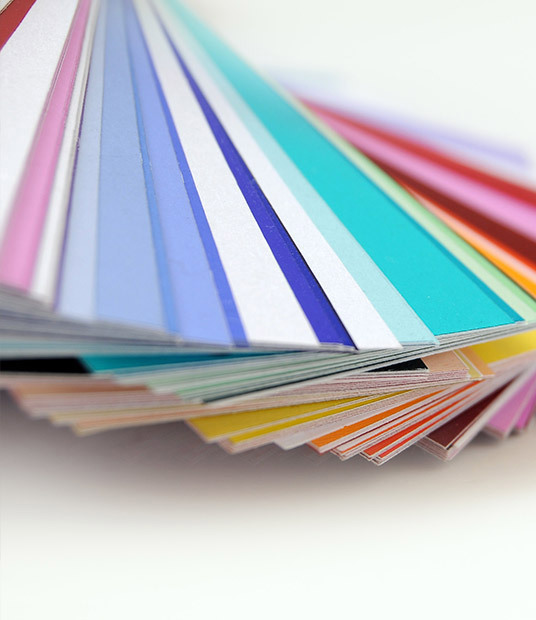 We suggest selecting from Resene or Dulux ranges for custom colours as we have matched many colours from these in the past and keep formulas handy. We use ultra clear glass for our splashbacks so can match any standard solid colour you bring in to us. We can make up colour samples on request and provide this service for free (for confirmation) if we are doing the job. Keep in mind the 'whitest' whites may take a slightly dulled look with refraction through the glass medium in some lighting situations. * Estimated lead time based on supplier deliveries and typical drying timeframes. Contact us for a quote over the phone, via email, or to arrange to meet a consultant on site. If you havent already chosen your colour, our consultant will have some samples with him and is experienced to help you in the selection process. On acceptance of a quote we will conduct a final measure. The glass is then cut to the accurate size and tempered. The glass is spray painted with our specially formulated paint. When it is dry we will call and arrange the install (installation generally takes 1-2 hours depending on the size of the job).